So, Where are the Vercors? This huge regional natural park of over 6000 square kilometers, lies between the relatively flat Isere river valley running from Grenoble in the north and down its west side to Valence and a sheer line of limestone cliffs with spectacular views over the Alps run down its eastern flank. This region is famous for spectacular river gorges, including the Combe Laval the largest in Europe which is on our doorstep. Ancient roads, carved over 100 years ago from the impressive limestone walls that line these gorges are dotted with natural stone arch tunnels and sheer drops with views out over spectacular river valleys. 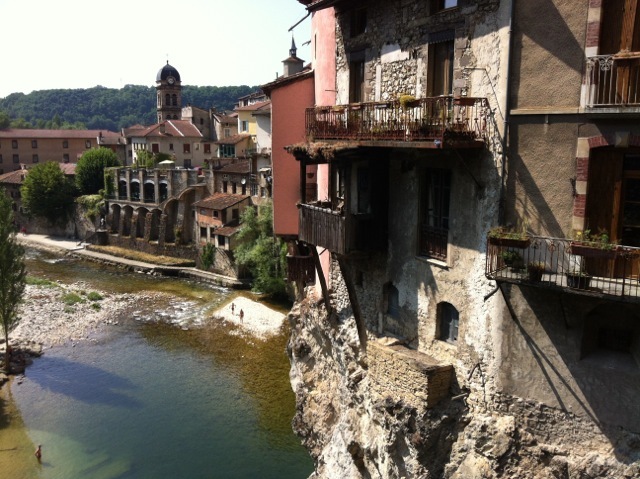 Towns such as Saint-Jean-en-Royans where we are based and Pont-en-Royans on the lower western side of the region provide the gateway between the relatively flat cycling of the Isere valley and the more challenging routes of the high Vercors. This Spectacular National Park is home to 22 cols, 17,000m of climbing and some of the most vertiginous roads in the world. The highest mountain pass stands at 1600m with the highest point of the Grand Veymont reaching 2341m. The Vercors include many cols visited by the Tour de France, including the Col de Bataille, Col de Tourniol and Col de Romeyere. Col de Machine is recognised as one of France's most spectacular roads engineered out of the cliff face over 100 years ago and the gruelling 21km classic switchback, Col du Rousett is stunning. Below is a video of Roger on a hair raising descent of the Combe Laval. 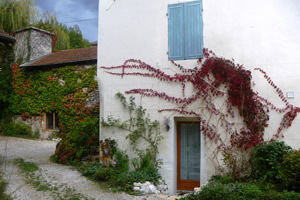 What makes this region so special is the enormous diversity in the terrain from Alpine mountain passes, limestone cliffs, forests, grassy plateau and river valleys, the rolling hills of the Drome and the flatter Isere Valley offering a huge choice of routes along low traffic, well surfaced secondary roads. We have chosen routes along the most beautiful, quietest roads passing through medieval towns, walnut orchards, river valleys with lots of photo opportunities and cafe stops. 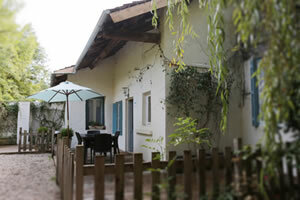 We are situated in the charming town of St Jean-en-Royans nestled 240m at the base of the Vercors National Park. All our rides start from the front door where there is only local traffic or those heading up the Vercors, so it is quite possible to ride for 2 or 3 hours with only a couple of cars passing you. 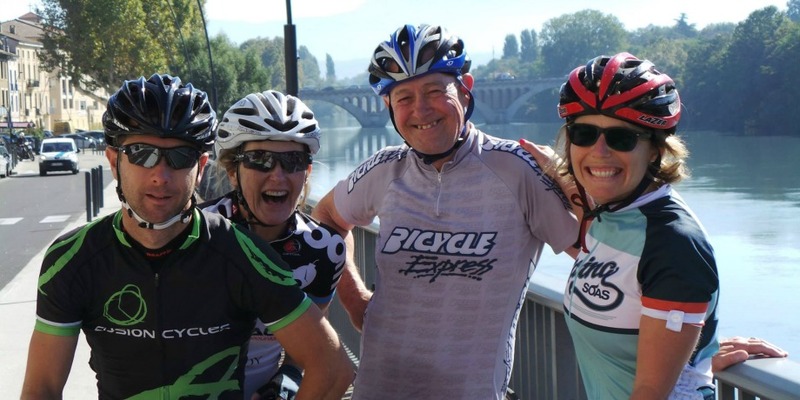 Even during the peak summer months of July and August the region is a cyclists' paradise. Shopping for food is easy and a thoroughly enjoyable experience as a short 5 min stroll will bring you into the heart of St.Jean-en-Royans with its infrastructure of shops, cafes and restaurants. There is the opportunity to stock up at the local Supermarket (a short drive to the edge of town) or ditch the car and shop at the smaller, independent shops where there is great pride placed on providing local, high quality produce. There are 3 bakers, a butchers and deli, a greengrocers, an artisan Patisserie dedicated to creating the most wonderful cakes and handmade chocolate. The town also provides a host of other smaller shops and facilities you may need during your holiday. A small food market visits the town every Thursday and Saturday. Next door is an Organic Trout Farm offering fresh or smoked fish which you can buy direct. For eating out the town offers a choice of gourmet, bistro or take-away restaurants. We can also suggest other restaurants in nearby villages that either ourselves or guests have recommended. The Vercors were an important hide out for the French Resistance during WWII. Tragically, the towns of Vassieux-en-Vercors and La Chappelle-en-Vercors were wiped out at the back in the war with a huge lose of human lives. A cemetery and memorial commemorate this loss of life at Vassieux-en-Vercors. 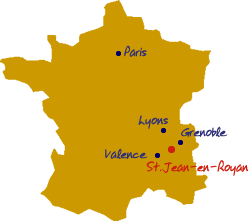 The nearest big town is Romans-sur-Isere (historically famous for its shoe manufacturing) 25kms away with the major cities of Valence 36kms to the South West on the Rhone and Grenoble – the Gateway to the High Alps, 55kms to the North East. Choose our 100km flat route through walnut groves, apricot and peach orchards to spin out your legs on a rest day. Our season runs from April to October In April spring is in the air, by May the spectacular apricot and peach orchards are in bloom. Summers are lovely, sunny and very warm but cooler the higher up The Vercors you go. Autumns are warm and extremely beautiful with the browns, oranges and yellows of the trees and vines changing colour. Winter brings the snow and the opportunity to head to the slopes (our nearest ski slope is Font D’urle, some 30 minutes away by car). It does rain, but not much.